KCSIE 2018: Are you Ready for 3rd September 2018? KCSIE 2018: Are you compliant? 3 crucial checks to determine if you’re meeting new guidance requirements. On 3rd September 2018, the Government’s update to the Keeping Children Safe in Education (KCSIE) guidelines came into force, and you need to ensure you are compliant with all the changes. To remain compliant with Ofsted and other inspectors, you must closely examine the content of all training and ensure it reflects the 2018 update to Keeping children safe in education (KCSIE). Not all Child Protection training is the same - ensuring the annual staff safeguarding training meets DfE requirements goes beyond just accepting the name of the course at face value. Examining the outcomes of any course is vital to ensure staff are compliant. Do not take anything for granted. High-quality child protection training that will satisfy inspectors, should be more in-depth than the basics of listing types of abuse and spotting the signs. KCSIE 2018 stipulates that the whole school community, from support staff to headteachers, need to be mindful of the role they can and may play within any Child Protection referral or ongoing investigation. Your annual staff safeguarding training must reference this, as well as educate staff on the update of specific safeguarding concerns and definitions within KCSIE 2018. Read how EduCare have updated courses in our EduCare for Education® service, which includes the content of the bestselling Child Protection in Education course, to reflect the new statutory guidance. The updated document has been available on the DfE website since June 2018, and as such, it is anticipated that Ofsted will ask to see school policies referring to the updated guidance. Compliance will go deeper than naming the new statutory guidance and having paperwork in order as a tick box exercise. Ofsted are looking for safeguarding policies that run across all schools and colleges and are embedded in the culture and ethos. Unfortunately, typing up a document and placing it on a shelf will not be enough. Staff need to be brought on board with the changes, in particular how peer-on-peer abuse has been included within all policies. Watch our video entitled ‘What Ofsted are looking for in a safeguarding policy’ to find out more. The key theme of the changes in KCSIE 2018 is peer-on-peer abuse. Whilst this safeguarding issue is nothing new, the fact that it is included in KCSIE 2018 as a specific safeguarding issue, and the introduction of the new Part 5 on child-on-child sexual violence and sexual harassment, shows the importance the DfE are placing on it. The term contextual safeguarding has been introduced and, Ofsted are likely to be looking for an understanding of how to take a contextual approach to safeguarding issues. This will help demonstrate compliance by showing you are up-to-date with current safeguarding issues and best practice in keeping children and young people safe. Read our blog article ‘What is Contextual Safeguarding?’ to find out more. 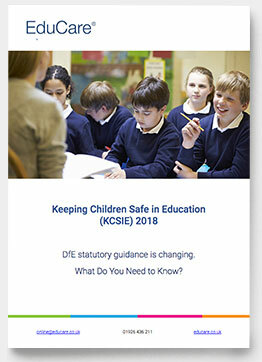 For your detailed report on the update to KCSIE, including our step-by-step checklist of what you need to do to be compliant, simply enter your email address and we'll send you our White Paper, written by experts. We will send you a copy of our White Paper, and keep you informed of other relevant safeguarding topics via email. Need a quick and cost-effective way to update all your staff on KCSIE 2018? Demonstrate compliance quickly and easily with EduCare for Education®, our cost-effective, unlimited access, online Safeguarding and Duty of Care service containing courses that have been updated to reflect KCSIE 2018, including a new Peer-on-peer abuse course, together with a robust reporting suite to evidence learning to inspectors.